Now that we have created a project and entered the basic information, we can enter the project scope. 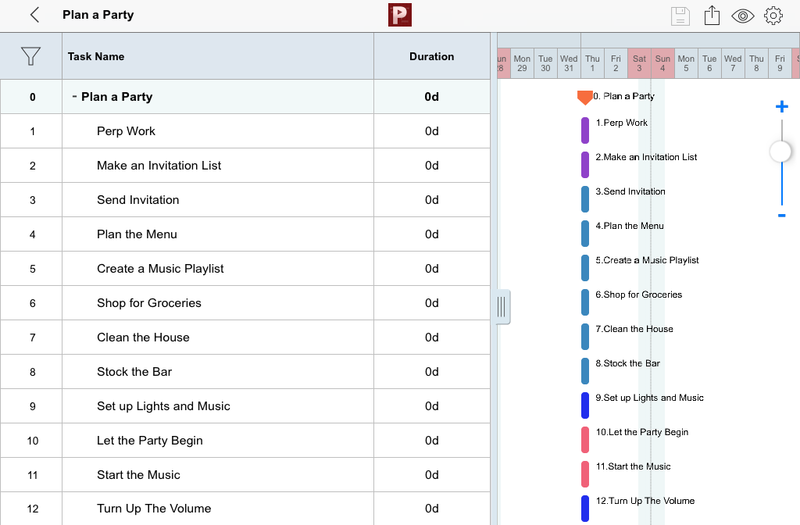 Project Scope is simply a list of every task, activity or milestone in a project. You can enter this in the task name column as shown below. Start by creating a simple list of all the tasks without any indentation, duration or dates. 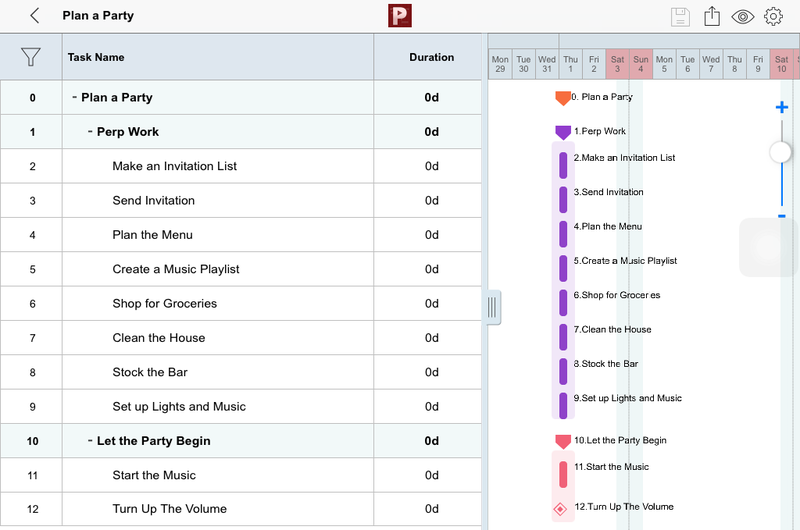 For example, if you were planning a party, a basic task list would look like this. You can later group these tasks by indenting them, thereby creating a group of tasks having a summary task. These groups are also referred to as phases of a project. In the image above, note that tasks 1 – 9 can be grouped together by making task 1 (Prep Work) the summary task of tasks 2 – 9. 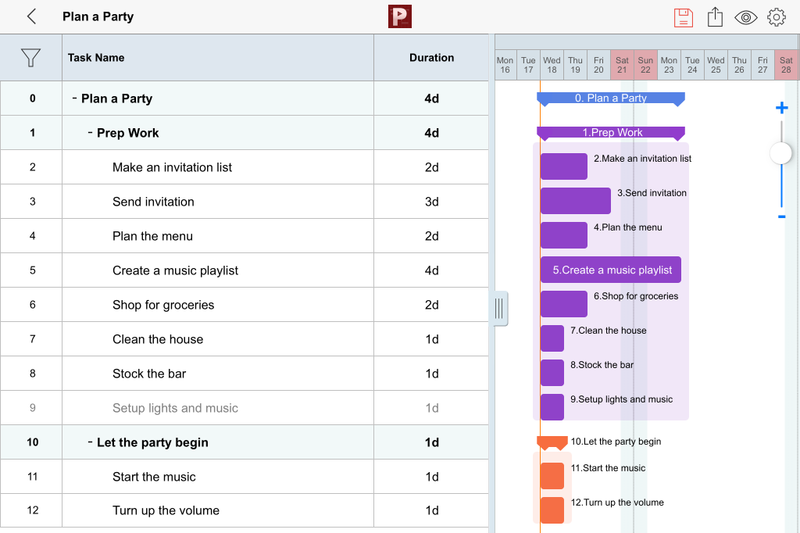 Similarly tasks 10 – 12 can be grouped together by making task 10 (Let the party begin) the summary task of tasks 11 – 12 (See image below). The next thing you can do is, enter milestones. Milestones are reference points in a project usually marking a significant event in the project lifecycle. Eg: A phase completion in a project. Milestones are useful to monitor project progress. Tasks set as milestones will have zero duration and will be displayed as a diamond shape. Once you have the WBS ready, we can move on to the next step – Entering durations for your tasks. Once you have added dependencies to your tasks the next step is to add resources. 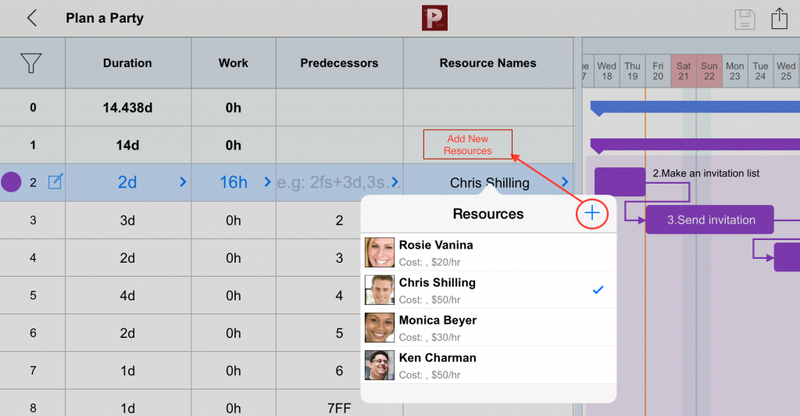 Project Planning Pro allows you to add work type resources to your project. Work type resources are people who are part of your project who will be assigned specific tasks. You may also enter cost/use or cost/hour for your resources and Planning Pro will calculate the cost for the tasks and the project cost for you. Double-tap on a task to activate the inline-editing mode and tap on the resource name field. You can select from the available resource or add a new resource for your project (See screenshot below). Tap on the gear icon next to a task and launch the Edit Task view. Tap the Resources tab and tap on resource name field to select resources or add new resources for your task. You can also manage resource allocation for your task in this view depending on the hours each resource is going to work on that task. These 5 basic steps should help you get started with a project in no time. You can also sign up for our newsletter below for regular updates and Tips-n-Tricks. Step 3 covers, adding durations for your tasks. Duration of each task would the effort required to complete the task in hours or days. Note, the duration and date of the summary task (eg: Prep Work) is auto-calculated based on the duration and dates of all its child tasks (task 2-9). In the next section we will see the most powerful feature of Project Planning Pro – Adding dependencies to tasks. Create a new project and define some basic information like Project name, Start date, Author. Use the standard default calendar or create a new calendar to change weekly offs and working hours. Tap on + button on top of screen. You have now created your first project. We will see later how to add tasks, duration, dates and dependencies to give shape to your project. Project Planning Pro comes with a Standard Default Calendar. Before you proceed, if you wish to change the calendar for your project this would be a good time to do it. Assign a new calendar to your project to select weekly-offs, change working hours, mark exception working hours or exception working days. There are two types of calendar in PPP, Enterprise and Local calendar. 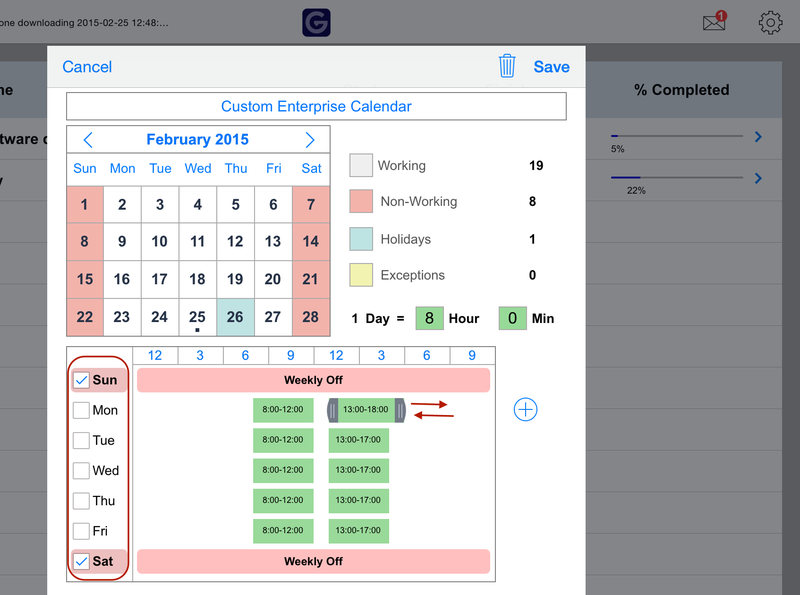 Enterprise calendars are available across all projects. Eg: Standard Default Calendar. Local calendars can be created within a project and is available only for that project. Tap on settings button on Project list page and select Calendar (See image below). Tap + and add new Enterprise calendar. Select weekly-offs, Set working hours, Select a date on calendar to mark as holiday, Select weekly off on calendar to mark as exception working day. Save. Once you have created a calendar, select the new calendar to activate it for your project. Welcome to Project Planning Pro, the simplest and most powerful app to plan everything, right from simple home-based projects to complex multi-million Dollar projects. Typically speaking, Project is a planned set of interrelated tasks to be executed over a fixed period of time and within certain cost and other limitations. 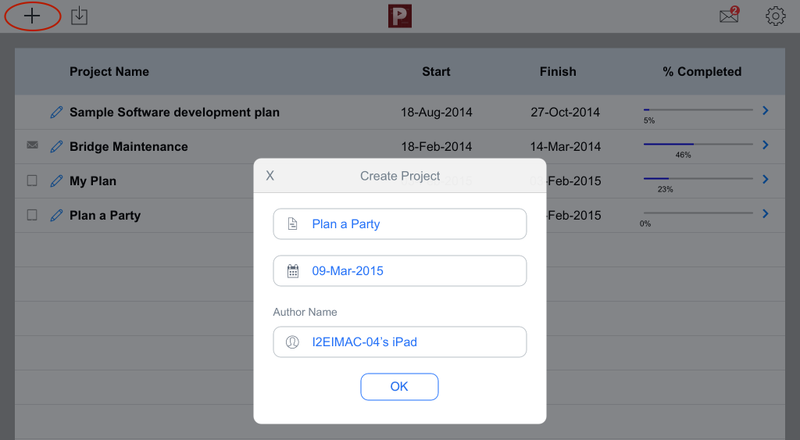 You can start off, by creating your project plan easily by entering tasks, dates, duration’s, dependencies and resources in Project Planning Pro for iPad. The app also supports the import and export of Microsoft Project plans (MS Project 2003 and above) which can be saved in the XML format. Having a workable plan is essential for the success of a Project. In simple steps, mentioned below, an effective and executable project plan can be created. These 5 easy steps should help you set up a basic project in no time.